L. Ron Hubbard exposed the brutal truth of a psychiatric chemical onslaught, the likes of which this world has never seen. This, then, is the story of 21st century cultural wastage. Also detailed is Mr. Hubbard’s clear and understandable solution to all chemical toxins, with the Purification Program and the worldwide network of Narconon centers. Rediscovery of the Human Soul chronicles L. Ron Hubbard’s philosophic quest to the founding of Dianetics and Scientology. Various rare essays, selections and discussions from all critical junctures of his philosophic journey are included. Explore the “universal language” of music through L. Ron Hubbard’s lifelong pursuit as a musical director, arranger, performer and composer. Here, too, are his landmark articles on sound “behavior” and musical form. Also included is a rare view of the world-famed L. Ron Hubbard Music Studio. Mr. Hubbard left an extraordinary legacy: an immense body of wisdom that leads man to spiritual freedom; the fastest-growing religion in the world today, Scientology. As the founder of the Scientology religion L. Ron Hubbard has described his philosophy in more than 5,000 writings, including dozens of books, and in 3,000 recorded lectures of Dianetics and Scientology. Those who regularly employ his teachings to improve themselves and help their fellows come from all walks of life, while Scientology missions and churches have been established on six continents. The universal acclaim for the man–including thousands of awards and recognitions from individuals and groups and the unprecedented popularity of his works is but one indicator of the effectiveness of his technologies. More importantly, there are millions of people around the world who consider they have no greater friend. Although best known for Dianetics technology and the Scientology philosophy, L. Ron Hubbard cannot be so simply categorized. If nothing else, his life was too varied, his influence too broad. There are Bantu tribesmen in southern Africa, for example, who know nothing of Dianetics and Scientology, but they know L. Ron Hubbard the educator. Likewise, there are factory workers in Albania who know him only for his administrative discoveries; children in China who know him only as the author of their moral code, and readers in a dozen languages who know him only for his novels. So, no, L. Ron Hubbard is not an easy man to categorize and certainly does not fit popular misconceptions of “religious founder” as an aloof and contemplative figure. Yet the more one comes to know this man and his achievements, the more one comes to realize he was precisely the sort of person to have brought us Scientology–the only major religion to have been founded in the twentieth century. 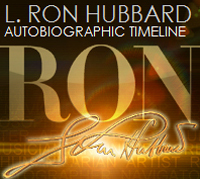 L. Ron Hubbard’s works represent a statement of man’s nature and potential, and even if echoed in various ancient scriptures, that statement is absolutely unique. Among the essential tenets of the Scientology philosophy: man is an immortal spiritual being; his experience extends well beyond a single lifetime; and his capabilities are unlimited even if not presently realized. In that sense, Scientology represents what may be the ultimate definition of a religion; not a system of beliefs but a means of spiritual transformation. How Scientology accomplishes what it does is through the study of Mr. Hubbard’s scriptures and the application of principles therein. Official headquarters for the Church of Scientology International. Covers information on Scientology churches, missions and groups. Audio and video presentations. The World Institute of Scientology Enterprises is an association of men and women dedicated to making the world a better place through providing L. Ron Hubbard administrative technology to individuals, groups, organizations and governments. Scientology spiritual counseling is called “auditing”. L. Ron Hubbard developed a precise technology that anyone can learn to apply to free himself and his fellow man of self-imposed entrapment. Made available by the Church of Scientology International, this text covers basic Scientology beliefs and practices, demographics and biographical information. since 1968, presents investigative reporting in the public interest. Scientology missions provide Scientology counseling and introductory training to people around the globe. Learn about the role of Scientology missions and find one near you. Learn about issues the Church of Scientology International supports, activities it sponsors, find press releases and information on Scientology spokespersons. Twenty-five years ago, L. Ron Hubbard created the Scientology Volunteer Ministers program to provide help to those in need. Use the locator to find and e-mail a Scientology Volunteer Minister. Learn skills to help yourself, your friends and your family. Covers how to improve relationships, strengthen or salvage marriages, parenting techniques, drug education and prevention, and much more. © 1996-2012 Church of Scientology International. All Rights Reserved.